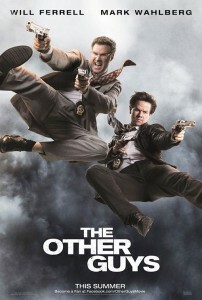 THE OTHER GUYS Opens August 6 NATIONWIDE. Detective Allen Gamble is a forensic accountant who’s more interested in paperwork than hitting the streets. Detective Terry Hoitz is a tough guy who has been stuck with Allen as his partner ever since an unfortunate run-in with Derek Jeter. Allen and Terry idolize the city’s top cops, Danson and Highsmith, but when an opportunity arises for the Other Guys to step up, things don’t quite go as planned. In order to enter the contest, become a fan of ReviewSTL on Facebook and post a comment on the ReviewSTL fan page telling us why you want to see the movie! NO PURCHASE NECESSARY. PLEASE REMEMBER TO READ THE RULES! SCREENING IS THIS TUESDAY, AUGUST 3.